Show off your favorite items and keep drinks close with the addition of this occasional table group. 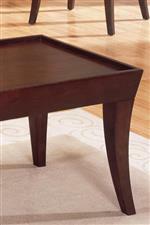 Each piece features a rimmed edge on the table top to help you protect your prized possessions. Tables also feature an open design that lets light through to help make a smaller space feel and look bigger. The Zen Casual Occasional Table Group with Espresso Finish by Homelegance at Beck's Furniture in the Sacramento, Rancho Cordova, Roseville, California area. Product availability may vary. Contact us for the most current availability on this product. 3216B-31-end Casual End Table 2 24" 24" 26"
3216B-31-cocktail Casual Cocktail Table 1 48" 24" 20"
Bring light and style to your living room or family room with a casual style piece from this collection. Each piece showcases a beautiful espresso finish as well as a table top with a rimmed edge that helps keep your items safe. Gently tapered legs allow plenty of light through and help to make a smaller room feel bigger, making each piece perfect for completing a smaller room. The Zen collection is a great option if you are looking for Casual furniture in the Sacramento, Rancho Cordova, Roseville, California area. Browse other items in the Zen collection from Beck's Furniture in the Sacramento, Rancho Cordova, Roseville, California area.